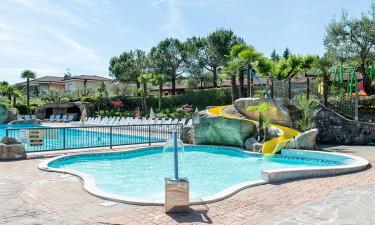 This holiday camping site is located only minutes from Lake Garda; one of the most famous natural attractions in all of Italy. While the natural splendour of this region is certainly worth mentioning, it is just as important to realise that the facilities which are offered within Camping Eden itself are just as impressive. Should you and your family wish to learn more about this camping holiday or to book a reservation for the future, please contact Lux-Camp directly. The campsite is constructed in various heights with several terraces and is therefore not suitable for walking-impaired people. If you and your family are like countless others, one of the reasons that you desire a luxury camping experience is to "unwind" from the rigours of everyday life. Indeed, camping in luxury has never been more satisfying thanks to the amount of wellness activities to enjoy. 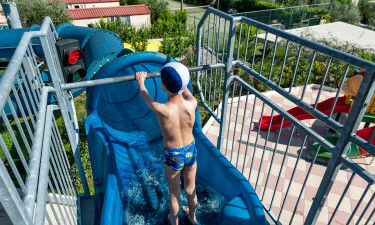 An open-air pool is always a main attraction and should you desire a bit of serenity, thermal baths and saunas are located but a short driving distance from this holiday camping site. 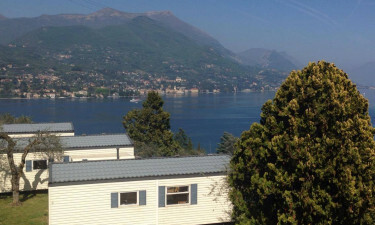 Why go to Camping Eden in Lake Garda? Are you planning to visit Camping Eden with a group of friends? If so, this luxury camping site also provides a wide variety of sporting attractions that can be enjoyed. 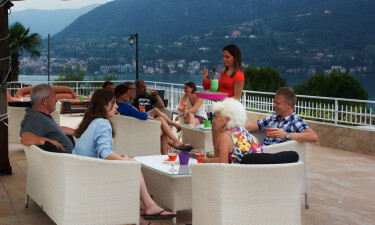 Some of the most popular include table tennis, bicycle hire, sailing and surfing upon tranquil Lake Garda. Of course, touring the nearby villages or simply taking a jog along the sandy lake shore can be enjoyed regularly. Contact Lux-Camp for more details in regards to these and other sporting activities. If you simply cannot stand being separated from man's best friend, this camping holiday is the ideal choice. Dogs are allowed during both on- and off-peak seasons. Therefore, feel free to bring your furry partner along with the family when you arrive at this holiday camping site. Also, this is a great way to avoid what may otherwise prove to be expensive domestic boarding fees. Like the market, a local bar and restaurant is open throughout the season. All of the normal benefits can be enjoyed including happy hour, dancing, Italian ice cream and a host of dishes which are offered as takeaway products. Thanks to such year-round entertainment, camping in luxury is quite a reality when choosing Camping Eden for your next excursion. You and your loved ones will be pleased to know that an on-site market is open during the entire luxury camping season. This will supply fresh produce, meat, bread and a variety of fruits and vegetables. Other items such as international newspapers, tobacco products and camping items are likewise provided here. Thankfully, this market is found quite close to the permanent mobile homes located here.